You are probably used to seeing Audrey do all the posting, but now it's my turn! 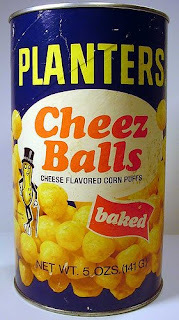 Today, for some odd reason, I had a craving for Cheez Balls... Remember the cans of melt in your mouth goodness that Planters used to produce? Yes, that's right... USED to produce! They have recently discontinued the production of Cheez Balls. For all of you who have forgotten about these incredible goodies, but would like to sign a petition, please do so! WHAT?? That's criminal. I love cheese balls, puffs, tos, and every other kind of Chee. HA, Sam's club has a barrel like 5 times the size of that can that are pretty good. It takes a true cause for the man to blog. Very true Becky... But I figured out Planters plan. Planters is just waiting for the right time to re-launch their Cheez Balls, and when they do... Our food storage will consist of Cheez Balls and water.